International science collaboration shows insect infestations of trees are halved with the adoption of an international invasive species standard, preventing billions of dollars in future damages. 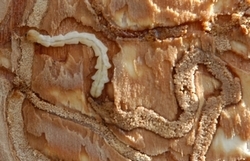 Scientists from Crown research institutes Scion and AgResearch and several organisations in the USA have found an international standard has been effective at reducing infestations of bark- and wood-boring insects. This is very good news for countries that value forest and amenity trees. Preventing biological invasions is a top priority for New Zealand’s primary industries and conservation agencies. An important threat to biosecurity is the movement of unwanted insects and plant diseases that can hitch a ride on pallets and other wooden packing materials. To remove the hidden hitchhikers that move around the world by this pathway, New Zealand and 77 other countries have adopted an international standard (“ISPM 15”) that involves treating wooden packing materials by heating them to at least 56° C for 30 minutes. “Comparing changes in infestation rates before and after the introduction of the standard ten years ago, we found infestations had dropped by at least 50%,” said Eckehard Brockerhoff, a principal scientist with Scion, lead author and co-author of papers arising from the study into the standard’s impact. The scientists also modelled the economic costs and benefits of the standard. They found the standard could be expected to provide net benefits exceeding US$10 billion by 2050, for the USA alone and even greater benefits worldwide. The upfront investment in terms of increased pallet costs was more than outweighed by the benefits of prevented forest pest invasions. “While the study did not extend to modelling economic impacts for New Zealand, we can be certain that there will be significant net benefits here and worldwide. “The people most likely to benefit are those living in cities, home owners and local government because they are usually the first to feel the impacts of a new invader which can lead to the expense of removing and replacing dead trees,” said Dr Brockerhoff. The net benefits from the international standard extend beyond financial savings to encompass non-market and ecological values, and the benefits reach beyond New Zealand and the USA. Dr Michael Ormsby, a New Zealand member of the International Plant Protection Convention (IPPC) Secretariat in Rome, says “the work of the international research group is greatly assisting the IPPC in its role of protecting the world’s plant resources from pests”. The international collaboration included ecologists, entomologists and economists who collaborated via the National Center for Ecological Analysis and Synthesis, a think-tank at the University of California. Infestation and trade data was provided by the US Department of Agriculture. New Zealand’s Ministry for Primary Industries provided policy information and reviewed the reports. The findings of the study were published in the journals Frontiers in Ecology and the Environment http://dx.doi.org/10.1890/130311, Ecology http://dx.doi.org/10.1890/13-0465.1 and PLOS ONE http://dx.plos.org/10.1371/journal.pone.0096611.